Record Store Day 2016 Minus One at Audio T Southampton! With just a few hours left we are very busy preparing the store for Record Store Day 2016! With only 3 days to go until Record Store Day we were very glad to see the limited edition RSD RP1s arrive this morning! One thing we won't know until Saturday is if one of the decks has been "signed by a star"! 12 of the turntables have been signed by famous artists and secretly shipped so nobody knows it they will have one until they open the box!. Don't forget that we are giving one of these turntables away as a prize on the day. All you need to do is visit Derricks Music on Oxford Street Swansea, fill in the entry form and keep your fingers crossed. Rega Record Store Day Limited Edition Turntable. As Record Store Day approaches, we at Audio-T Manchester are getting ready for a busy day of all things vinyl and beautiful turntables. These special units can only be sold on or after Record store day which is on 18th April 2015. 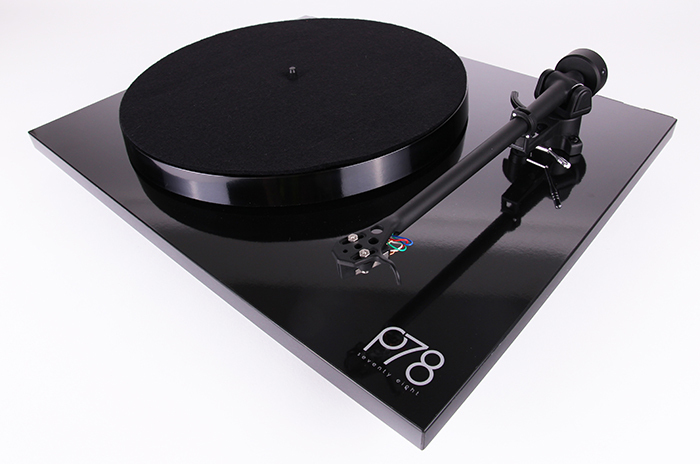 We have added some snippets from Rega's website regarding these very special turntables. These rare beauties will be selling for a very reasonable £250. Rega will manufacture 500 units of the very limited RSD/REGA turntables. Thirteen units have been exclusively signed by some of the participating artists. (see list below). 12 of the signed turntables will be secretly shipped in amongst the 500 units and all 500 will be security sealed. 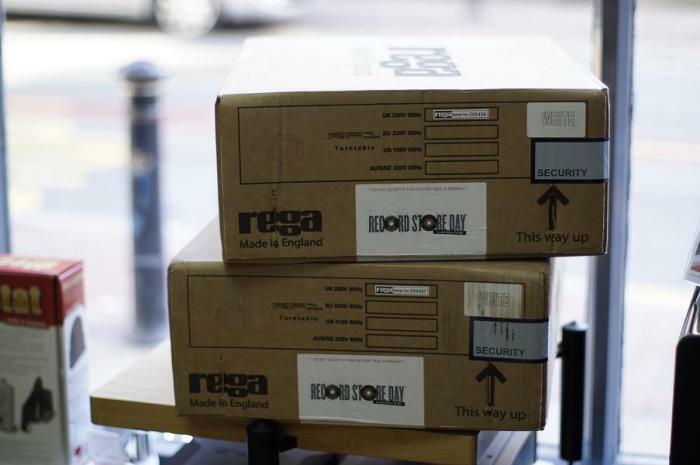 So, there you have it, could you be the lucky owner of a signed REGA RSD turntable? Come along to Audio-T Manchester on Record store day. Remember folks!!!!! We have 1 remaining "record store day" turntable. Could it be the one??? After the success of the 2014 Record Store Day we are once again teaming up with Derricks Music to make 2015 even bigger and better! Put APRIL 18TH in your diary now! This year Rega are the main sponsors of the day and have released a limited edition RSD version of the RP1 turntable. Visit Derricks Music on the day for your chance to win one of these limited edition turntables! All you have to do is be there on the day and fill in the entry form. Once again there is a huge list of exclusive vinyl that will be released for the day. Either have a look at the Record Store Day webiste here or visit Derricks to have a look at the releases. 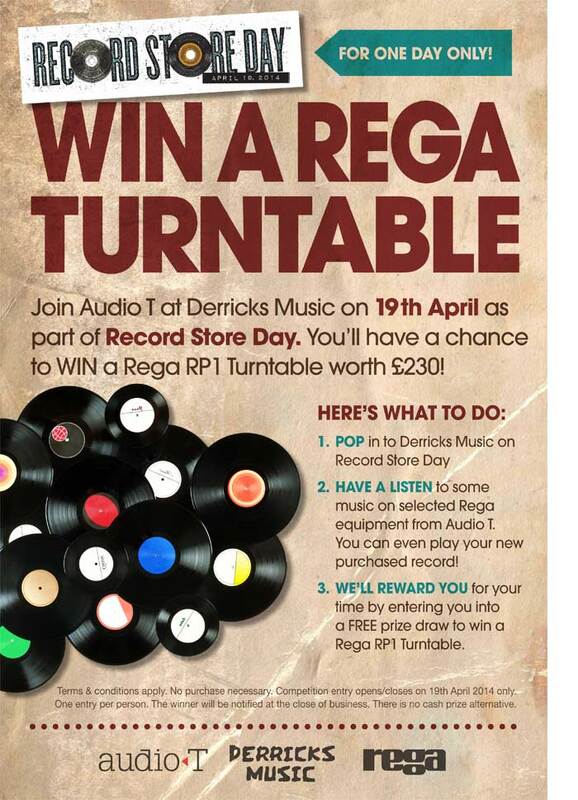 We will be at Derricks on the day showing a large range of rega products and playing records all day, you'll even be able to have a listen to your record on the RSD deck and you never know... you could be the lucky winner! I will also be on hand to answer any questions you may have about your turntable or hi-fi system, from set up queries to upgrade options. 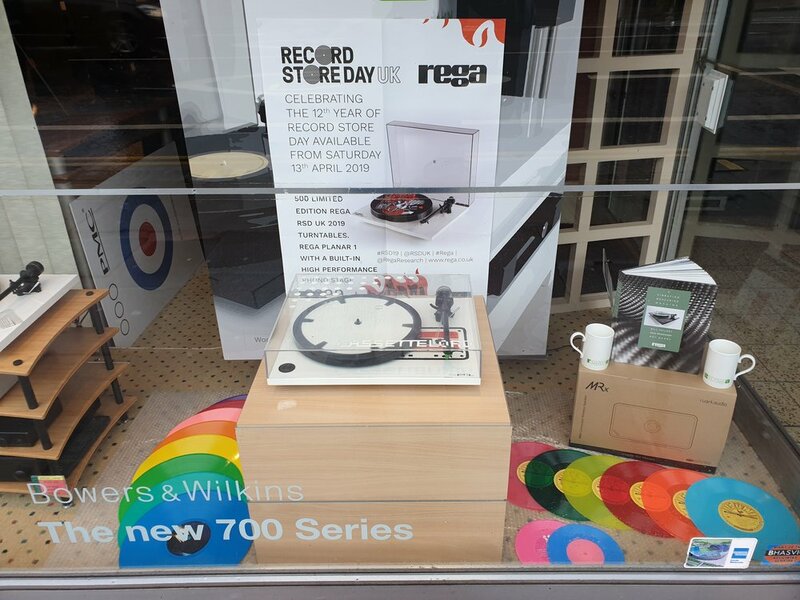 You can read more about the Rega RSD deck and their link to Recors Store Day here. If you want to order any f these special releases you will need to call in to Derricks Music in Oxford Street or give them a call: http://www.derricksmusic.co.uk/ I've already ordered mine!!! To help celebrate the day, we will be at Derricks Music showing Turntables from one of the UKs most well known manufacturers - Rega Research. We will of course have a full system running should you want to give your special purchase a spin on the day. We will also have some of the component parts of the turntables so you can see what exactly goes into these machines. I wonder how many times I am going to say "phenolic" on the day???? ...and the best bit: FREE PRIZE DRAW!!!! WE ARE GOING TO BE GIVING AWAY A REGA RP1 TURNTABLE TO ONE LUCKY CUSTOMER COLLECTING THEIR RECORDS ON RECORD STORE DAY! To qualify all you will need to do is let us have your name and email address.